As I prepare for an upcoming writing conference where I will get to propose a book idea, discuss my blog, etc. there is pressure to redefine the purpose of my blog, revamp my look and define my audience. But, as I pray for direction in these areas, these verses and that chapter continue to jump out at me and speak to my soul. I write because I truly believe that God reveals to me extraordinary treasures as I live my ordinary life. And, I can’t help but share what He teaches me. My audience, honestly, is whoever wants to listen, whoever wants to join me on this adventure of discovering the nuggets of truth He show us in His Word. In Paul’s time, clay jars were created by artisan potters who would take raw clay and though the skill of their hands mold the clay into a precious vessel. After the clay was molded and baked, they would beautifully decorate the jars using paint and glaze. The jars would be decorated based on the value of the items they would contain. Sometimes they would be decorated beautifully because they would hold precious items such as scrolls of scripture and law. Other times they would be minimally decorated because they would have a more basic function such as holding water. 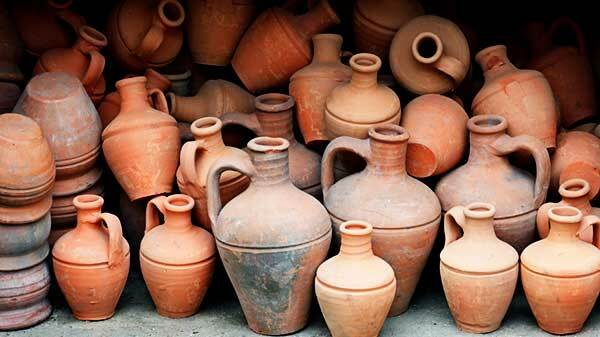 But one thing all clay jars had in common was that they were breakable and they would not last forever. We are just like those clay jars of old. Our physical bodies are “jars” that hold precious treasures. Our bodies were created and molded by the Potter with a specific purpose in mind. Our bodies are beautiful, functional and breakable. They are also temporary. They are a temporary, functional container that hold precious, eternal treasures. What are some of the treasures God entrusts us with? * 2 Corinthians 4:6 says that God has shone the knowledge of Him in our hearts. We have the privilege of housing the knowledge of Him in such a way that it shines forth into the world around us. * Scripture also teaches us that we are a temple of the Holy Spirit (1 Corinthians 6:19). Even though I’ve known this truth for some time, it’s still so hard for me to truly comprehend that my ordinary body is a TEMPLE for the Holy Spirit. Sit with that truth for a while. Are we living like people who house the 3rd person of the Trinity? Eek! So, the question for you and for me is this- do we live like one who walks around as a container of extraordinary treasures? Thank you for your prayers, Susan! And, thank you for visiting my blog.